We had a late Fathers Day because 1. my presents hadn't arrived from Amazon and 2. nothing got organised. Anyhow on the Wednesday we went out for a meal and I got some nice cards, a photography book (The Moment it Clicks - Joe McNally) and the Creative Aperture Kit for my Lensbaby. With any lens there is an effect where within the out of focus areas any points of high contrast take on the shape of the aperture. 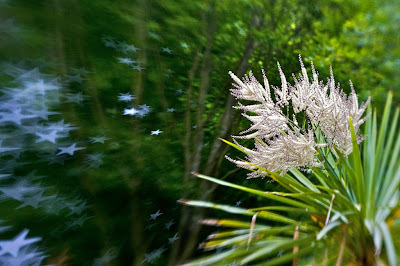 This is called the "Bokeh" and usually nice bokeh in high quality lenses is as circular as possible. This is achieved by having a big number of aperture blades and making them slightly curved. Cheaper lenses tend have as few as 5 straight aperture blades which gives the bokeh points a pentagonal shape. In the Lensbaby the aperture is changed by using little rings that are droped into the front of the lens and held by 3 small magnets. All of the standard aperture rings have perfectly round holes in them which is why the Lensbaby bokeh looks so good. 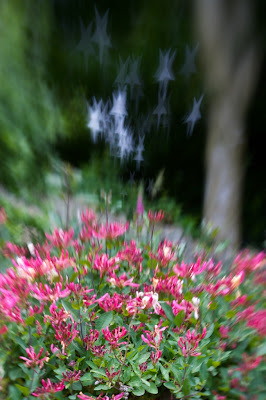 However the Lensbaby is a creative peice of equipment and using aperture rings with different shaped holes can give the images a quite novel look. The kit comes with a star shaped aperture, a heart shaped aperture and 5 blanks that may be made into any shape by the use of a sharp knife. In these first images I have just used the supplied apertures and I am considering ideas of shapes for the others. 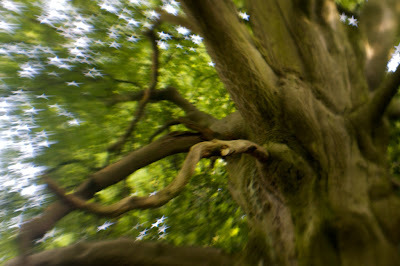 I guess I will wait until I have some more ideas for images I want to take and then cut apertures to suit the subjects. In this first set of images I have used light coming through trees to provide the points of high contrast. Other ideas I have had so far are light reflecting from the surface of water, street lights in the distance in a dusk or dawn shoot or brightly coloured flowers in a field. I wonder if dark points on a light background would also work? In which case dark flowers in a light coloured field or dark spots in snow or a flock of birds in the sky might work. So to my first image which was taken through the open window of my study. The plant in the foreground is a Cordlyne which we planted when we landscaped the garden about 7 years ago. When it was planted it just looked like some long leaves growing out of the ground but each year more leaves sprout from the top and the ones at the bottom die back to reveal a long thin trunk. The plant is now well over ten foot high and for the first time has sent out this rather strange looking flower. The trees on the banking behind the garden supply the light for the star shaped aperture. Behind the Cordyline we built a decking with an open timber roof which we have been training a honeysuckle plant to grow over the top. This next image is showing the honeysuckle flowers starting to open with the same tree background as the first image. 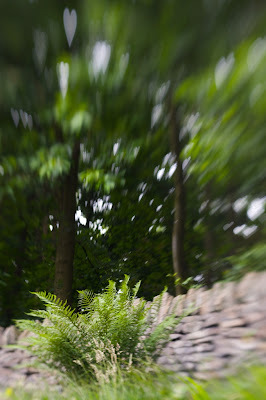 Further along the banking there is a nice clump of fern with the wall and the trees behind. This time I've used the heart shaped aperture. While I had the heart shaped aperture in the lens I went back and made another image with the honeysuckle in the foreground. 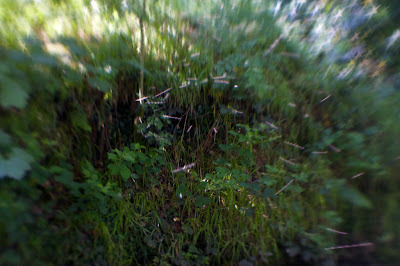 At the weekend I went for a walk in one of the nearby woods with one of my aims to make some more Lensbaby creative aperture images. To be honest I was struggling to find some good subjects which had the requisite light through the branches for my background. 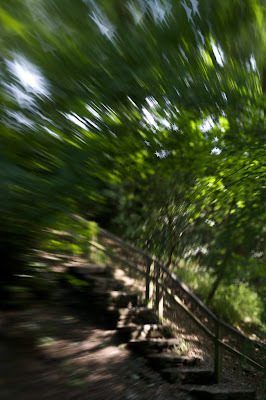 This first one would probably have been the best shot but the stairs are well out of focus, even for a Lensbaby image. In this next shot I was actually trying to get the flying insects to be my main subject but again my focus was not where I wanted. Intrestingly however, because of the fairly slow shutter speed the insects show as dotty lines where their wings are opening and closing as the fly along. It's hard to tell with the image size on the web but looking close up at the ones towards the edges of the image they are taking on the star shape where the wings are open. Final image from this set and again the focus suspect (it was quite dark in the woods and my eyes are getting old). However I quite like the way that the lighter coloured leaves in the background are also taking on the star shape from the aperture. 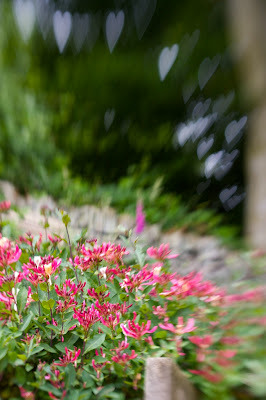 I'm quite looking forward to more experimenting with the creative apertures and I will post more as I progress. My problem is that being relatively new to photography I'm jumping around using different techniques and equipment and trying to get to grips with a wide range of things at the same time. The thing is that I don't want to concentrate on one area for too long and I'm looking to combine bits together to make different types of images. I guess eventually I may come up with a style of my own but until then I'll try a bit of everything. 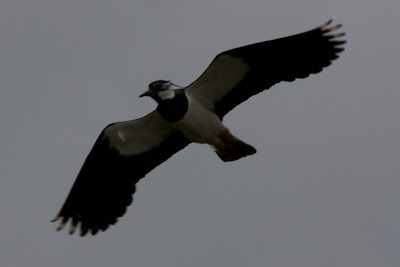 Tomorrow I hope to post some more attempts at capturing Lapwings and Curlews (still not satisfied with the results but I'll keep trying). 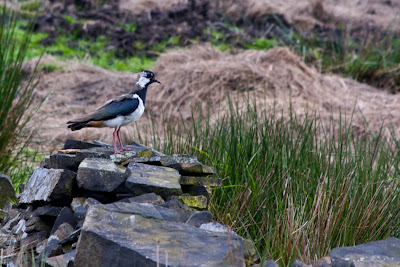 Now I hadn't set off with the intention of making more bird images but the opportunities just arrived as we walked. I'd set my target on walking from Wessenden to White Moss via Black Hill to give me and Evey dog some much needed exercise. It was a bit overcast and cool when we set off but within a short while the temperature began to rise and I was getting pretty warm from the exertion so I ended up carrying my jacket for about 90% of the journey. 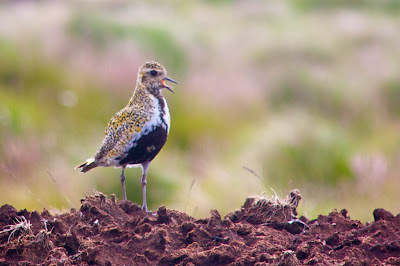 The climb up to Black Hill is quite steep but I was rewarded by this Golden Plover sat up on top of a little bank not too far from the path. I made a few initial shots from the path with the bird up on the horizon and then slowly headed towards the bird for some closer shots. I had to get Evey to stay behind me because the bird was looking quite nervous as we approached. Evey was very interested as the bird was continually squawking. 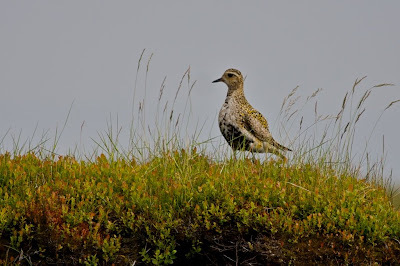 Another few steps closer and the Golden Plover was starting to walk away from us still squawking but quite unhurried and showing us the beautiful feathers on its back. I moved a few steps closer but I guess we'd entered its personal space and it flew off a few meters. I didn't think it would have let me get any closer if we'd have pursued it so I went back to the path. At the Black Hill trig point the walkers I'd seen earlier had stopped for a break so I had a chat with them. They were heading for Edale which is about a 25 mile walk from where they had started at Wessenden. I told them that I wasn't going too much further, just to White Moss and then I would ead back to my car because I was going to Honley Show with the family in the afternoon. One of the guys said he thought that this part of the Pennine Way had been spoilt by flagging it and that he had to practically swim to the trig point on previous visits. I have to disagree because it makes the area more accessible and also protects the peat land from being damaged by people walking all over it instead of keeping to the paths. I headed South East to try and pick up the path to White Moss as it is a bit undefined around here. There are a lot of small pools in the peat bogs and I was trying to make some images of the sky reflecting in the pools but with very limitted success. 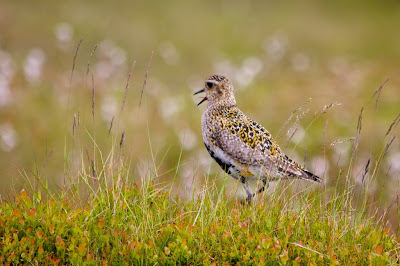 As I was knelt down trying to get some low shots across the water another Golden Plover landed behind me and started with it's squalking again. I don't know if it was the same one but it was just as noisy. 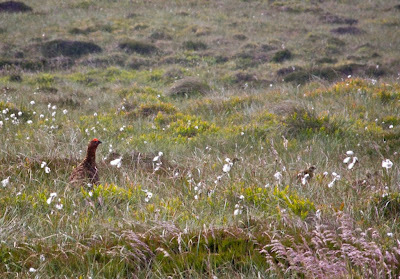 This time the bird was heading toward me across the dried peat and showing its dark coloured chest. We found the path and started heading down from Black Hill towards White Moss and the sun was starting to get quite strong. I took a few more images as we walked of the views including some images ready to tone map in HDR. When it got to a little after 10:00 we headed back as I thought it would take us about 2 hours to get back to the car. 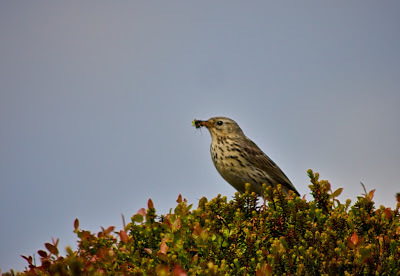 As we headed back up towards Black Hill there were lots of little birds flitting around and I managed to get close enough to catch this one perched on the top of a juniper bush with an insect in its mouth. 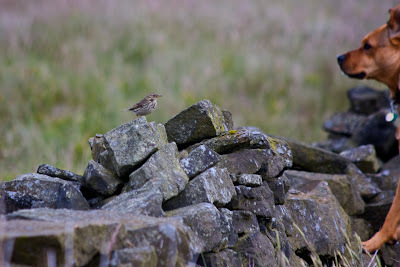 I thought maybe it was a Sky Lark because there were some little birds flying high and singing away. The thing is that little brown birds are quite common and they all look the same to me. 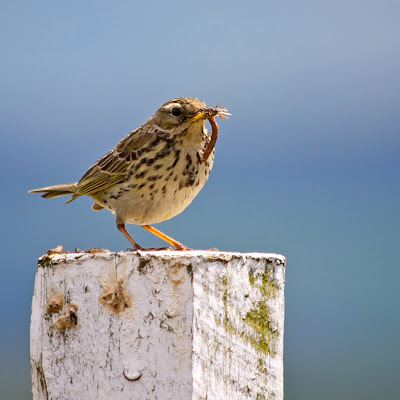 I had a look on the RSPB bird identifier site and its more like a Bunting or a Pipit of some kind. The Larks seem to have a bit of a tuft at the back of the head so I think it rules them out. On the way back down Black Hill I spotted another little brown bird sat on the top of a white post withe something in its mouth. As usual I fired off a few quick shots and then moved in closer for some better shots. I think it's the same sort as previous bird but at this angle it looks shorter and fatter. As I got cloer I could see it had several things inits mouth and it didn't seem to bothered about me getting closer. Unfortunately there was a man with his son following me down the hill and talking very loudly (apparently he thought he was going to lose his job because the company was making cuts and the bloke that worked for him could do his job but was paid a lot less) so I had to get the shots quickly before it flew off. In fact it didn't fly off but I think I got close enough. I suppose this all goes against one of my previous posts where I gave reasons why I couldn't be a nature photographer. I still don't think it would be something that I would limit myself to doing and I can't afford the expensive glass but I get a buzz from making images of wild animals and birds. I must get back to one of the local nature reserves and see what's happening now and I'm looking forward to going to France on my holidays because our first stop is at a bird park . It's been too long since my last post. My problem is that enjoy making the images so much that I don't get around to putting them anywhere. Maybe now I've got some ink for my printer I'll finish some more images off ready for printing and publishing on the blog. So I've spent more time taking shots to make High Dynamic Range images and I've been experimenting with all the different sliders in Photomatix to see what results I can produce. The results can be wildly different from images where it's not obvious they are HDR to those which are almost surreal. I've been saving some of the settings so I can try them out with different sets of shots and compare the results. I've found that different images are more suited to different settings and some really look quite poor at certain settings. I'll do another post later to illustrate some of the things I've discovered but in the meantime here are some recent images I like. 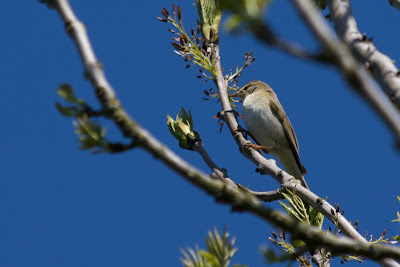 Here's a little bird which I've tried to identify on the RSPB Bird Identifier and I think it might be a Chiffchaff but then it could be anything. Another little bird and Evey is giving it a good looking at. Again I don't know what this is but it obviously has very little fear. I don't think Evey knew what it was and so she was regarding it very closely before it flew off. 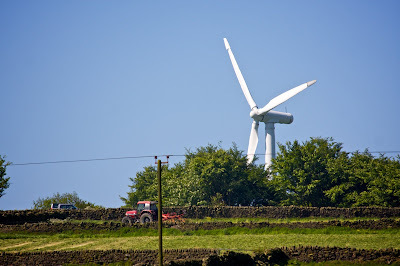 One of the wind turbines rising up from behind the trees. This was quite early morning and most of the turbines were stationery. This is a place where I have taken a number of shots at different times of the year and with varying amounts of water in the reservoir. 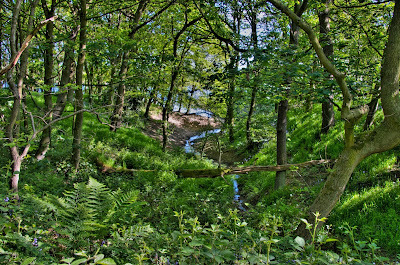 This day it was bright, the trees, plants and grass were very green, the water level was low so I thought I'd try a HDR. 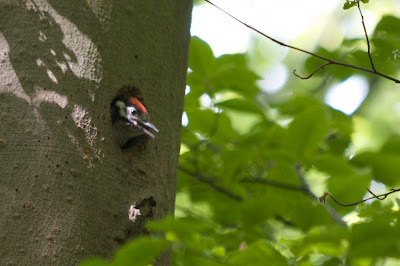 Yet another bird, this time a little woodpecker. It could be a male Lesser Spotted but I think it's more likely to be a young Greater Spotted because I think it was calling for food to be brought. It was very noisy and I thought I saw a brief glimpse of a parent flying about. 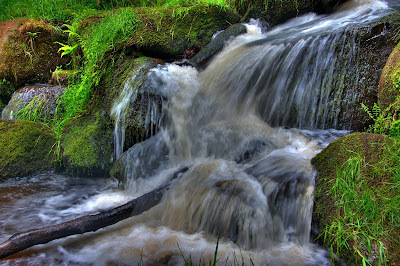 Another HDR of a little waterfall with a tree branch wedged into the rocks. I took a set of shots to create a HDR of this bridge but I decided I preferred this image which was the normal exposure shot adjusted in Aperture. 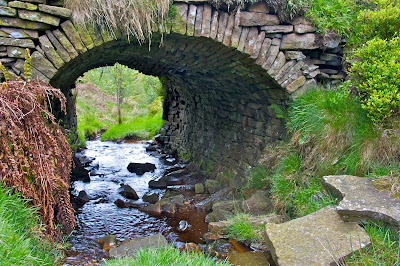 I used the shaddow slider to bring up the detail of the stones inside the bridge and then just standard adjustments to the contrast and colour saturation. The HDR image was blurry because it was a bit windy so the grass and fern had movement in them between the three shots so the software couldn't make a sharp image like this one.